CAIR Florida has discovered that despite Sam Kharoba being exposed for lacking qualifications and for teaching anti-Muslim Bigotry, Florida Law enforcement has used him over 20 times to train cops to fear Islam and harass Muslims. In July 2012, CAIR Florida held a press conference to bring this issue to the attention of the Florida Department of Law Enforcement (FDLE). At the end of October 2012 we spoke to the 40 training directors and 20 CJSTC commissioners to share with them our concern regarding the use of Kharoba. Read our message to the FDLE and CJSTC: "10 Problems with Sam Kharoba." We also submitted to them a 30 page report: "An Analysis of Sam Kharoba's A Law Enforcement Guide to Understanding Islamist Terrorism" which details the problems with Kharoba's training. In response to our requests, the FDLE and CJSTC made it clear that Kharoba is not a "CJSTC certified instructor" and that the FDLE has stopped using Kharoba for over a year and he is not scheduled to conduct more FDLE training. In fact, the FDLE has adopted the BJA's State and Local Anti-Terrorism Training (SLATT) standards which completely discredits Kharoba's training. CAIR Florida has also received confirmation from several training directors that they would not permit Kharoba's training. However, as there are over 40 training centers in Florida and the FDLE has no control over non-mandatory training courses that they provide, CAIR Florida will continue to monitor the training to ensure that inaccurate and prejudiced material is not tolerated. CAIR's assessment of the Kharoba's manual contents was based on the 2011 federal interagency guidelines on CVE curriculum standards, Countering Violent Extremism (CVE) Training: Guidance and Best Practices. Our assessment indicates that neither Kharoba's professional/education background, nor the content of his manual come close meeting to the standards set forth by DHS. Kharoba lacks relevant subject matter expertise. Kharoba has no formal academic degrees in Islamic studies, and no prior experience in law enforcement. 15 out of the 19 chapters we analyzed (79%) have sections of text that are nearly word-for-word identical to a Wikipedia article. 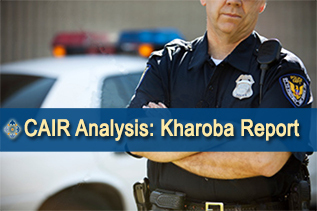 Read CAIR's Assessment on Kharoba's Guide Online!